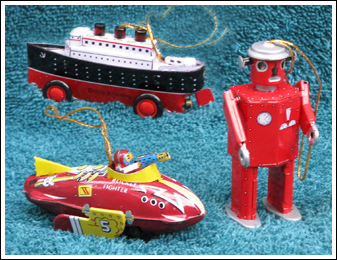 During the early part of this century, most toy cars, trucks, planes, boats and robots were made of tin. These replicas (the wheels move) are made mini-sized to be the perfect nostalgic ornaments for your holiday tree or just to sit on a shelf. (Not suitable as toys for young children). Includes one each atomic robot, spaceship and ocean liner. Each ornament (appr. 3” long) comes in its own decorative box.